No matter what kind of retail therapy you and your companions need, you&apos;ll find it in Gatlinburg and Pigeon Forge. There&apos;s nothing like a meaningful souvenir to keep your memories of the Smoky Mountains fresh for years to come. The Appalachian region, of course, is renowned for its authentic regional crafts, and you can find plenty of examples in Gatlinburg and Pigeon Forge during your vacation in Tennessee. The Great Smoky Arts & Crafts Community is in itself a unique gathering of more than 120 artists and craftsmen from the area – in fact, this 8-mile loop represents the largest group of independent artisans in the United States. This thriving, year-round art community gives you a firsthand look at the kinds of objects typical of Appalachian folk art. Artisans display the skills handed down for generations as they whittle, carve, paint, sew and sculpt all manner of collectible items: hand-dipped candles, one-of-a-kind quilts, dolls, brooms, pottery, stained glass, clothing and much more. The kids will be entranced by the authentic homemade candy on display, and the entire family can partake in refreshments at the community&apos;s soda fountains, cafes, restaurants and tearooms that each expresses the character of the Great Smoky Mountains. The Gatlinburg Craftsmen&apos;s Fair combines art and folk music to entertain the entire family. Two specialty fairs – one in summer, one in fall – attract visitors and locals alike to enjoy the offerings of artists from around the U.S. The next fall fair, October 9-26, 2014, is open daily, with children under 12 admitted free. This year&apos;s fair features a host of country, gospel and bluegrass music shows along with the arts and crafts, so there&apos;s truly entertainment for everyone. Sometimes it&apos;s relaxing just to get away from the outdoor life and take a stroll through a mall. 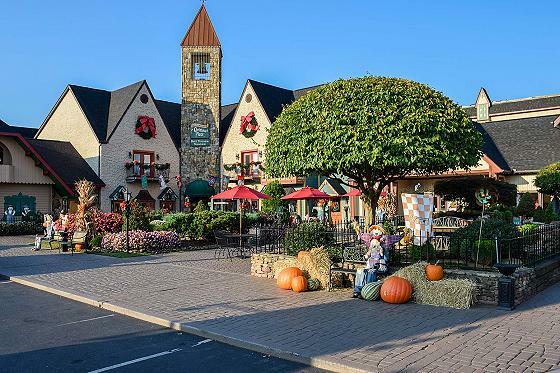 Retail therapy in the Smoky Mountains includes a selection of retail and outlet malls around Gatlinburg and Pigeon Forge, where a host of name-brand stores provides the ideal opportunity to pick up a real deal. Pigeon Forge Factory Outlet Mallis easy to spot from the highway – just look for the big red roof. Underneath it, you&apos;ll find nearly 200,000 square feet of "shopportunities" that include the names you know (CorningWare, Carter&apos;s, Big Dog Sportswear, Oshkosh) as well as some local names like the Smokies Furniture Connection and Rack Room Shoes. Be sure to check the outlet mall&apos;s website to find coupons and special offers. The Shops of Pigeon Forge tempt customers with names like Reebok, Eddie Bauer and Burlington, with a spectacular view of the Smoky Mountains right from the outlet. The Village Shops of Gatlinburg boasts a homey, welcoming atmosphere in which you&apos;ll find some 27 retailers and eateries, many unique to the area. This is where you can find hiking gear for your mountain trek, original silver jewelry to wear back home and Gatlinburg&apos;s coolest toy store, Cartoons & Toys. And be sure to hit The Hayloft for a colorful, playful selection of wearables for the motorcycle fan and the budding cowboy or cowgirl. Looking for a "small mall"? The compact, attractive Gatlinburg Aerial Tramway Mall is a convenient place to stock up on homemade fudge, Native American pottery, clothing and more. No matter what time of year you visit the Smoky Mountains, it&apos;s always a good time to check out the specialty Christmas stores. The holiday-themed shops of Gatlinburg and Pigeon Forge aim to put you in the spirit of an old-fashioned Appalachian Christmas with gifts to fill every stocking. Santa&apos;s Claus-et is a local favorite that&apos;s convenient to downtown Gatlinburg. Adorable ornaments and handmade gifts bring in plenty of shoppers – it&apos;s also a great place to stock up on bluegrass music CDs and locally crafted jams and jellies. The Incredible Christmas Place has a 28-year heritage in Pigeon Forge and has built a reputation as the biggest, most beautiful Christmas shop in the area. The shop personally decorates 50 Christmas trees – from traditional to contemporary – to give you some ornament inspiration, while the staff delivers one-on-one advice on home decorating and gift selection. You&apos;ll find floral arrangements, plenty of collectibles and fresh fudge served daily. During the Christmas season, Santa himself is available for photo opportunities. Smoky Mountain shopping reflects the area&apos;s strong, proud history as well as a nod to today&apos;s consumer. Find what you&apos;re looking for ... or something you never expected ... during your trip to the Smokies.